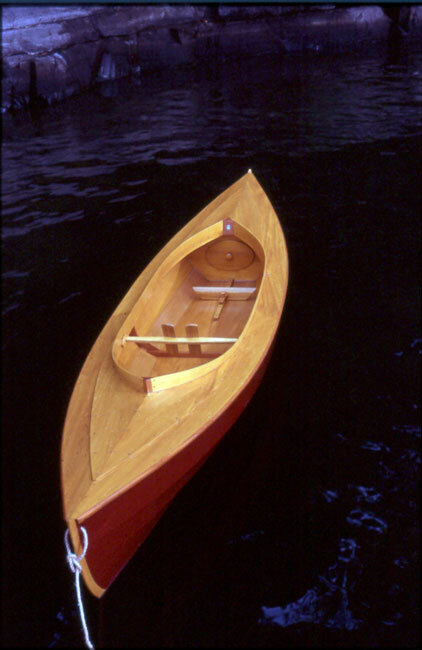 Peter Tomasi helped Harry and Martha Bryan with some painting, and received the plans for this 12' Fiddlehead decked canoe as a reward. He launched the canoe on August 31 at Button Bay, Lake Champlain, VT. He writes that "she is fun to paddle and easy to carry. She is planked and decked with white cedar, framed with mahogany, and her coaming and stems are ash. Her guardian angel is from 'Sweet Cecily'." Contact Peter at 10-A North Street, Bristol, VT 05443.